I've been neglecting exfoliators for a while now. I find them too abrasive and, put simply, they seem to do my skin more harm that good these days. I avoid anything with beads in it and tend to stick to simply using a muslin cloth or a flannel to buff my skin every day. This works for me well and I never really experience any patchiness from doing this. Still, a sample is a sample and what's the problem with simply trying something out? 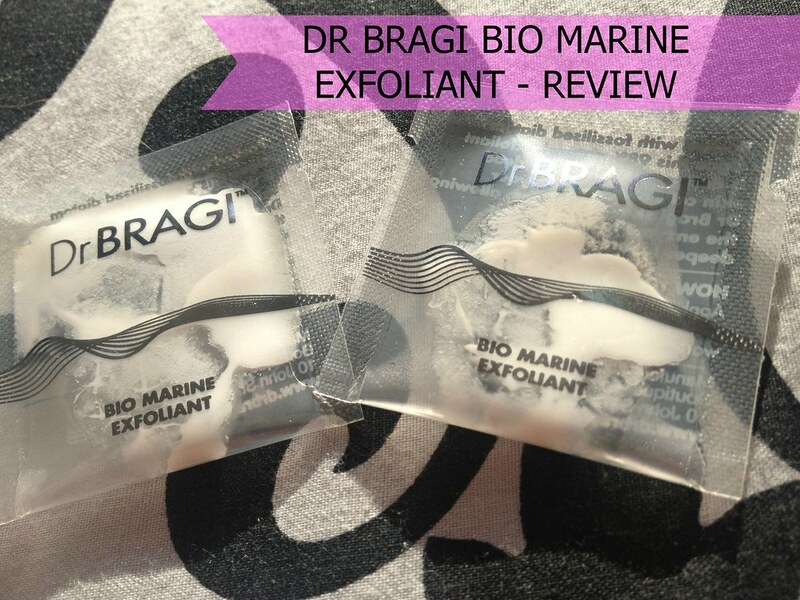 Dr. Bragi describes this product as a 'superior facial exfoliant packed with fossilised diatom algae and Witch Hazel to cleanse, brighten and renew' considering it to be an easy at-home treatment similar to microdermabrasion. This exfoliant allegedly targets congested areas of dead surface skin cells and excess oil, encouraging cell renewal, whilst clearing and minimising pores. I only used the bare minimum I could of these tiny sachets once a week over four weeks and, suprisingly perhaps, there was more than enough product for this length of time. It really does go a long way. 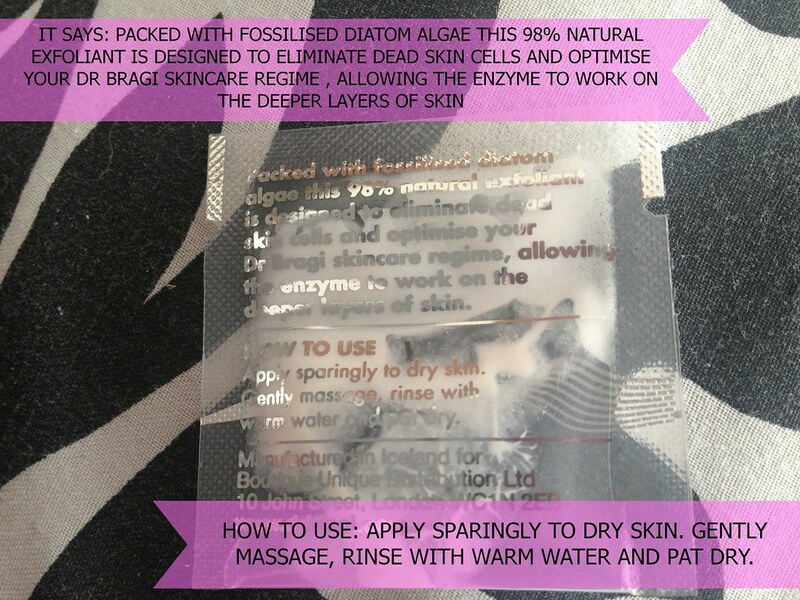 I followed the instructions carefully and applied the exfoliant onto dry skin. The texture is quite gritty but it's so finely ground up that it doesn't feel like anything is scratching my skin. I massaged it across my face quite a lot, taking time to get into the areas that I know I'm prone to dead-cell build up such as across and around the nose but I avoided my eyes completely. I washed my face off and patted it dry to find my skin feeling smoother and softer but as for visible differences - there didn't seem to be any. It was a couple of weeks into using this product that I started to notice that my skin did look a lot brighter and I thought my make-up was sitting better. Would I recommend it? I liked using it a lot and to be honest I think that someone with more congested skin than mine would benefit from it immensely but there was just something missing for me... I couldn't put my finger on it precisely but I think it just didn't feel 100% necessary in my skin routine. I could take it or leave it which is never the best sign in a product. Still, if you get the opportunity to try it then I think everyone should so they can make up their own minds about it.